The fundamental act of cognition is the separation of one thing from another. Our senses have evolved to distinguish: there is no information in uniformity. The black cat in the cellar at midnight is a visual joke that mocks us with a world of objects so indistinguishable that we can no longer perceive them (other than by tripping over them - in this joke not all senses are occluded). This ability to distinguish, to separate, is ingrained throughout the human nervous system. When I run my fingers over a smooth surface, I feel the smallest imperfection; when I lie awake during the small hours of the morning, each creak as the house cools, each rustle as a leaf moves in the wind, is the audible equivalent of an almost invisible scratch mark felt as my fingers run over the paint work of a car. The largest part of the brain is devoted to perceptual processing, to cognition. There is an old myth that scientists don't understand the function of 90% of the brain. This is untrue. Most of the brain is devoted to speech, hearing, and visual perception. Modern neurophysiology is in reasonable accord with computer research that attempts to simulate and reproduce the characteristics of networks of brain cells: the brain is a sophisticated device for analysing differences and reducing them to recognisable patterns. This occurs at every level of cognition, from networks of cells in the optic nerve that trigger when presented with vertical lines, to the ability to distinguish between similar but different abstract ideas. The mystical idea that the world is an illusion created by the senses no longer seems even slightly incredible. We do not know what the world is like in itself, but we do know that the world that we perceive in our internal sensorium is the product of networks of inconceivably interconnected brain cells that can be observed to trigger when presented with particular patterns. Even an organism as primitive as a housefly can learn to recognise and associate a visual pattern (such as black and white stripes) with food. If a housefly can do it, then our human ability to distinguish and separate one thing from another is likely to be inconceivably complex (as indeed it is). So complex that mystical systems such as Vedanta assert that human beings en-masse have lost awareness of the distinction between reality and the fabrications of perceptual processing. What if there is some kind of closure between a mysticism that asserts the illusory nature of "the world", and modern neurophysiological views of cognition? A common view of mysticism is that it is an attempt to obtain direct experience of God, or Oneness. That is, the goal of mysticism is expressed in terms of the metaphysical view that there is a larger a priori external reality that can be apprehended directly. The goals and assumptions of mysticism are generally framed in terms of religious tradition; for example, Kabbalah extended the traditional methods used to explain Jewish sacred texts, and in doing so evolved a metaphysic for the creation and function of the divine universe that illuminates rather than diverges from traditional Judaism. The practitioners of Kabbalah also extended traditional Jewish prayers and practices to produce a mysticism that was experiential and potentially ecstatic as well as philosophic. Similar observations can be made about Christian mysticism, and also about mysticism in Islam. An alternative view of mysticism is that it strips bare and reveals the cognitive apparatus. The mystic, in contemplation, uncovers the organic cognitive and perceptual structures underpinning the mind. Mystics themselves have not been blind to the relationship between perception, cognition, and mystical experience - the more sophisticated meditational exercises in Raja Yoga seem to have been designed by people who were completely aware of this relationship. If this is so, we could expect the experience of separation to be a major theme in mystical writing and symbolism. A fundamental representation of separation is the bisection, the splitting of a whole into two parts. The whole could be represented by a circle, and the bisection by a line going through it, or the whole could be a line and the bisection another line, forming an equal-arm cross. What is the fundamental mystical bisection? It is separation from God. In some manner the wholeness has been sliced by a knife, and a part chopped off. One of the most benign views of this separation can be found in the Timaeus of Plato. Plato's cosmos is fundamentally dualistic. Plato asked the question "what is true", and by that he was asking whether there was anything that was eternally valid, beyond opinion and circumstance, something that any being anywhere in the cosmos could immediately verify. Without truth there is no knowledge. For Plato it was self-evident that an absolute must exist, what he called "The One" or "The Good", but he had difficulty reconciling this with the observation that the world of the senses is constantly changing - there must be some component of the physical world that is not in the One. Plato introduced a most profound and far-reaching idea, an idea that is basic to Western philosophy, science, theology and religion to this day: Plato suggested the existence of "stuff" that was contingent, mutable, and essentially the antithesis of the One. He was forced to introduce something that changed, and in doing so he chopped his metaphysical universe into two parts. The physical world we live in is the manifestation of eternal and immutable ideas embodied in "stuff", like dough stamped with a cookie cutter. The Lie? Plato did not see things that way, but others did. By the time of Plotinus, a highly influential follower of Plato who lived several hundred years later in Roman times, the "stuff that changed" was called "matter" (hyle), a highly technical concept that survives in everyday use to this day. Plotinus did not think that matter was good. He did not think it was evil in the active sense (he could not, because in Platonic philosophy Intelligence is divine and an attribute of the One), but he certainly regarded matter as the complete antithesis of everything the mystical philosopher aspired to. Matter became (and this idea is more completely developed in Gnosticism) The Lie. The earliest symbols for matter derive from the pre-Socratic philosophers who inspired so much of the content of Plato's Timaeus. From Pythagoras we have the idea that the cosmos is an embodiment of number. One is a point. Two is a line. Three is a plane. Four is the tetrahedron, the simplest, regular, three dimensional solid, and so four became the number of matter. From Empedocles came the idea that the universe is composed of four elements: earth, water, fire and air. 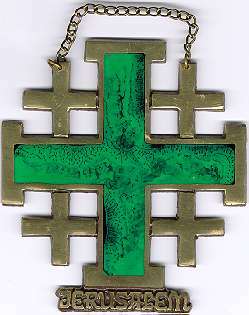 From this it is a small step to the adoption of the equal-armed cross, symbol of separation, as the symbol for matter, and the cross within a circle as the symbol for our Earth. The equal-arm cross is an eloquent symbol of separation. It is a symbol of bisection, the dualist opposition of God and Matter, of Truth and Lie. It is a symbol of matter itself, and its fourfold division into four elements. It is also a symbol of manifestation, the active process of being apart from God. In the Kabbalah, four-lettered name of God (called the Tetragrammaton) was interpreted as a symbol of the creation. The first letter Yod represents the raw, unformed creative power of God that (paradoxically) contains within it the archetypal forms that give shape to God's creative power. This form-giving capacity is represented by the second letter He, and is often associated with a mother, because the manifest universe, the third and fourth letters Vov and He (final), are her children. The letter Vov is is the son and king, while the final letter He is the daughter and queen. There is an extraordinarily rich symbolism associated with the king and the queen, and for reasons which will be discussed in detail later, they have become a symbol of separation. What is important at this point is the use of the number four as a symbol of "becoming", the infinitely elaborate process of repeated separation from the One that produces the complex physical world as we experience it. The gnostic fractal is the Veil of Isis, the fabric of reality that conceals the noumenal truth. Following the weaving allusion, it is also the web of the Black Widow, the dark goddess who spins reality and traps us in her web. The fractal is a prison with bars so fine that not even a gnat could squeeze through. But why "gnostic"? The fractal is gnostic because it is the illusion that conceals reality, the ensnaring Maya of Vedanta. The Truth is out there (note the Platonic assumption). The fractal is an illusion created by the infinite subdivision of the One to the point that all one can perceive is difference, and the underlying unity disappears. There is Truth, but it is concealed. The original meaning of the word "occult" (from the Latin occultus, to cover up or conceal) signified the hidden truth and reality behind error and appearance. The occultist was the original inquiring mind, and Scully and Mulder are the modern heirs to the gnostic quest for the truth behind the veil. From the sorrows of Urizen's soul. The meshes, twisted like to the human brain. And call'd it The Net of Religion. The heavens are dungeon-like, a prison, and they divide wherever Urizen steps, creating a web or net that snares the human mind. The Universal Man, to Whom be Glory Evermore, Amen. And every part of the City is fourfold; & every inhabitant, fourfold. This is a poetic representation of the gnostic fractal, the four-fold city that is four-fold at any level of detail. For Blake, the "sign of four" is not only a symbol of the recursive partition of reality into four primal aspects, it is a symbol of wholeness when each part is in its proper place. His mythic poetry begins with events that lead to the state of wholeness being lost, and describes the epic struggle to attain wholeness, symbolised by the union of the primal human being Albion with his emanation Jerusalem. It must be remembered that to the Kabbalist, judgement [Din - judgement, another title of Gevurah] means the imposition of limits and the correct determination of things. According to Cordovero the quality of judgment is inherent in everything insofar as everything wishes to remain what it is, to stay within its boundaries. The want of this determinate and bounding form evidences the want of idea in the artist's mind, and the pretence of the plagiary in all its branches. How do we distinguish the oak from the beech, the horse from the ox, but by the bounding outline? How do we distinguish one face or countenance from another, but by the bounding line and its infinite inflexions and movements? What is it that builds a house and plants a garden, but the definite and the determinate? What is it that distinguishes honesty from knavery, but the hard and wirey line of rectitude and certainty in the actions and intentions? Leave out this line, and you leave out life itself; all is chaos again, and the line of the almighty must be drawn out upon it before man or beast can exist. For Blake it is the line, a symbol of separation and definite form, that demarcates the creation from unformed chaos, and in Kabbalah it is this same abstract quality that dominates in the creation of the world. The separation of the cosmos from within God intrinsically required an unbalanced power of separation, and the first creation sundered - in the later Kabbalah of Isaac Luria this event was called shevirah ha kelim, "the breaking of the vessels". The excess of the power of Din could not form part of the subsequent cosmos, and remained as a permanent imbalance and source of evil, the kingdom of the Klippoth, or "husks". Why husks? Like the shell of a nut, or the rind of a fruit, the husk is the covering that separates. The Klippoth were often anthropomorphised as devils, but many Kabbalists interpreted the Klippoth as the essential principle of separation in its most pernicious form. An important Kabbalistic myth is that the Tree of Life and the Tree of Knowledge were originally one Tree, but when Adam plucked the fruit from the Tree of Knowledge, the two trees became separate. This act of primordial separation is referred to as the "cutting of the shoots". The Tree of Knowledge contains the power of Din, so what we have here is an allegory of the evolution of human consciousness: at one time (so the myth goes), the power of Din was not dominant, but by cleaving to the power of Din, Adam and Eve were ejected from the ideal condition of consciousness (a state Blake, who understood this myth, refers to as Eden). The primordial act of separation carried out by Adam in defiance of God's commandment was interpreted as the origin of sin, and a view developed in Kabbalistic circles that all sinful acts consist of separating what God intended to be joined, or in joining what God intended to be separate. It follows that if the universe and human kind are in a "fallen" state due to the power of separation, it should be possible to rectify this condition by attempting to undo the damage. This view is a major constituent of later Kabbalah, which is deeply concerned with actions which have the effect of unifying that which is unnaturally separate. For many Kabbalists it was the correct observance of God's commandments, as laid down by the traditions of Judaism, combined with mystical meditations, that was the principal method for carrying out unifications (yichudim) in the upper worlds, and this viewpoint transforms Kabbalah into an eschatological mission. The Kabbalist becomes an agent in the struggle to restore the cosmos to its rightful condition. A key concept is that of teshuvah, or "return", in which the cosmos returns to a condition of primal and blessed unity. The original context of the "end-time" was that the Jewish people were beset by great empires - Egypt, Assyria, Babylonia, Rome - and the question for centuries was "when will this end". When would the Jewish people be free of tyrannical powers? The Book of Revelation takes this idea and places it in a cosmic context: when would the world be free of evil and iniquity and sin? When would the ideal creation be restored? Error is created. Truth is eternal. Error, or creation, will be Burned up, & then, & not till Then, Truth or Eternity will appear. It is burned up the Moment Men cease to behold it. And I John saw the holy city of Jerusalem coming down from God out of heaven, prepared as a bride adorned for her husband. Similar imagery occurs in Kabbalah, where the restoration of the world to its original pre-fallen condition is symbolised by the union of the king (the cosmic or primordial Adam) and his bride, who is both the Shekhinah (the exiled spirit of God in the creation) and the community of Israel. In Blake's poetry this event is symbolised by the union of the primordial man Albion and his bride and emanation Jerusalem. In both cases the primordial act of separation that produced the fallen state of humankind is undone, and the creation is made whole once more. What an extraordinary vision! It may be instructive to attempt an interpretation by returning to my original assertion that a primary function of the human brain is to find and recognise differences. The mind is like a sword that divides on thing from another. Blake was aware that every line he drew on paper, every mark he made to distinguish one thing from another to give it definite and recognisable form, was mirrored by a process in his own mind that gave form to the external world. In this sense the mind creates the world - it draws lines through it just as an artist draws lines on paper. The English legal system embodies Aristotle's great dividing principle, the so-called "Law of the Excluded Middle": if something is not false, it must be true, and vice versa. There is no middle ground. There is no space between true and false, just as in the legal system there is no space between guilty and not guilty. The lines between things become infinitely thin. The foundation of logic, reasoning and rational thought is the ability to draw these ethereal, razor-thin lines between ideas and concepts, to delineate the space of ideas in just the same way as an artist creates a bounding form for each object in a picture. Read any book that is about an abstract subject - law, accounting, language, philosophy, mathematics - and much of its substance will be definitions - abstract line drawing through conceptual space. As human culture grows more complex, so the need to use language precisely grows more pressing. How is it possible to have a contract if the parties involved cannot define their terms? How is it possible for a government to allocate disability grants if it cannot define disability? What kinds of statements constitute libel? What kinds of films or books or pictures are morally offensive? How much background radiation, or air pollution or water pollution is bad for our health? Everywhere there are people drawing lines, carving reality into little pieces so that we can have consensus on healthy and unhealthy, safe and unsafe, diligent and negligent, holy and unholy, acceptable and unacceptable. This is the realm of Blake's tortured demon Urizen, the dungeon-like heavens dividing wherever his unhappy footsteps tread. For Blake, Urizen is explicitly identified with Satan, and in Kabbalah the chief of the powers of Din is Samael, the spirit who tempted Adam and Eve in the garden of Eden. They are essentially identical. Why do mystics view one of the most basic and necessary functions of the human brain in such a negative way? Perhaps it is because we have a tendency to become lost in the worlds of our own manufacture. We go from seeing the stylus to seeing the lines, and after a time it is easy to forget that there ever was a stylus. Collectively we become as peculiar as the person who refuses to believe that Sherlock Holmes is a literary invention. Too much energy is devoted to upholding completely arbitrary dogma as if it contained universal truths: the Byzantine Empire was torn apart in violent schism because of theological hairsplitting so arcane that most people today would require a university course to understand the issues. I mention the Byzantine Empire because it is far enough removed in time to offend no-one - unfortunately there is just as much heat and just as little light today as there ever was. There is too little understanding of what Korzybski calls "awareness of abstraction", that the boundaries between things are inserted as part of an active cognitive process and may not be part of the phenomenon being cognized, a situation he summed up in his immortal phrase "the map is not the territory". Mysticism is not well understood. The links that various schools have with particular religions tends to cast a supernatural glamour over the whole subject. The language and technical vocabulary used often presents a barrier to understanding. This is unfortunate, because it tends to result in mystics being seen as unworldly. I have presented here some evidence that mystics have (perhaps unintentionally) been deeply aware of the workings of human cognitive processes, aware of the way in which the brain synthesises the reality that we experience. At the same time mystics assert the primacy of an alternative mode of perception, a mode in which finiteness and separation are absent. The underlying unity of things is apprehended directly. The experience in this mode has been called "The One" (Neoplatonism), "Brahman" (Vedanta), "En Soph" (Kabbalah), and "The Eternal" (Blake). We cannot deny this as a phenomenon. We can deny the various interpretations, for example, that "God is in all things", but we must not deny the fact that many people in history (and in the present) have claimed a mode of perception in which all things are apprehended as an underlying unity. There is also a belief, in some camps, that at some time in the future this mode of apprehension will become general, and a new world order will prevail. Another aspect of this apprehension of unity is its intense realness: the experience is such that it undermines the reality of normal perception. The experience erases the lines between things, blurs the boundaries that normal cognition insists are "real". Many techniques of mysticism use what amounts to limited sensory deprivation. Meditation is a turning within, a withdrawal from normal interaction with the external world. The focus of attention moves from the external to the internal. Often gross physiological manipulation is used to heighten the experience - fasting, posture, breath control, psychotropic plants, ritual, intense visualisation exercises. The contents of the mind become the domain of observation, the new reality of the mystic. The mystic functions as psychologist and subject simultaneously in a self-imposed experiment to probe the workings of the mind. It is like a mirror trying to see itself reflected in itself. At a physiological level the inputs of an inconceivably complex mesh of neurons are fed back to the inputs. There is a well-known phenomenon that takes place when the outputs of a physical system are fed back to the input - such systems have a tendency to go into violent oscillation. The best example is video feedback, where a TV camera is pointed at a TV monitor showing the picture from the camera. The picture dissolves into pulses of black and white shapes, and may go totally black or totally white. The picture of the external world seen by the camera disappears, and what remains is a function only of camera-and-monitor, a self-contained system that experiences a reality of blinding simplicity and uniformity. Black. White. Black. White. [round about God in terrible majesty]." Another verse, however, states "He made darkness his hiding place". It is also written, "Cloud and gloom surround him." This is an apparent contradiction. A third verse comes and reconciles the two. "Even darkness is not dark to You. Night shines like day - light and darkness are the same." Perhaps this is all there is to mysticism, neurons turned inwards to the point of feedback and oscillation. Perhaps there is more. What is real? As Plato points out, when we try to gain knowledge about anything in the world, what we comprehend is not the thing itself, but that eternal and essential aspect of it that is accessible to reason, what Plato called its form. Galileo understood this when he measured how things moved. He wanted to know what underlies all the varieties of movement. He wanted to know what was true and valid in every case. He wanted to find "the form of movement", what Newton later codified as his Laws of Motion. What is more real, the pot as a cooking utensil, or the pot as an oddly shaped lump of stainless steel? There are many, many lumps of oddly shaped metal that are very little use for cooking, but very few of these have the form of a pot, and it is the form that has value, not the metal. At least, that is what the British government has concluded in subjecting its citizens to Value-Added Tax, a tax that specifically measures how someone adds value to something as a result of changing its form. Metal is worth more than ore. Pots are worth more than metal. Meals are worth more than pots and potatoes. Science would be little more that eternal classification if there were no simple truths underlying all the varieties of appearance. Galileo would still be rolling different kinds of balls down different kinds of ramp, and would have denuded entire forests for paper in the attempt to record his observations. This is not the case. Theoretical physicists come closer and closer to monism as they unify theories in the attempt to reduce every kind of observation we can possibly make about the physical world to the smallest number of underlying principles. Like the Kabbalist, the physicist carries out yichudim, unifications. but they are expressible in mathematics, a language and system of thought that people have invented, often for purposes of personal amusement and entertainment, and most definitely a product of the human mind. If the principle has more general validity that the events or observations from which it is deduced, and if the principle can be formulated in the human mind, perhaps mind and principle have much in common. This is certainly what the Platonist philosopher and mystic Plotinus believed - that the realm of intelligible forms is more real than the physical world. We have returned to familiar territory - this is metaphysics bordering on mysticism. Principle. Form. Shape. Line. Separation. And in the background, the finest minds on the planet carry out yichudim, finding invariants, gauge transformations, group operations in abstract multidimensional spaces, merging theories into one, unaware that the agenda of mysticism has become the agenda of science, and that theoretical science has become as unworldly, contemplative and esoteric as any mystical discipline. A person sitting in an armchair, through pure intellectual contemplation, can deduce that black holes exist in the fabric of space and time, and another person with a large telescope can find their telltale signatures. What inner realm of apprehension does a mathematician possess to make such a thing possible? Gandalf the Gray could do no better. Merlin would turn green with envy. The man with the mind instructs the man with the telescope. Who has the superior instrument for apprehending reality?